Do you love puzzle games? If you have answered in the affirmative, then you would be pleased to check out something that has to do with Tetris. This is one puzzle game that does not seem to have any kind of ending – chances are you will end up losing the game eventually as the blocks begin to stack up, and they drop faster than you can make lines disappear. When you lose, then just cover yourself with the $19.99 Tetris Fail Blanket, where it offers an epic win of a super soft and snuggly blanket which measures 45″ x 60″. 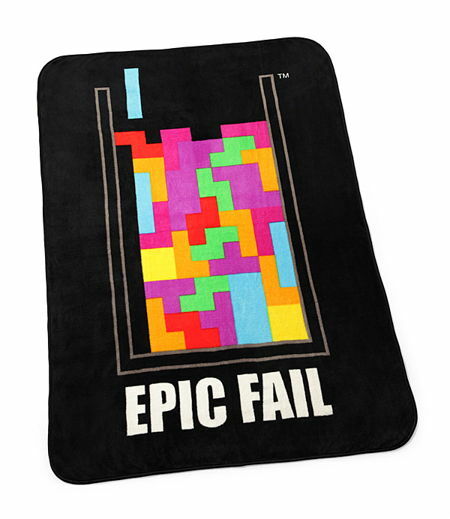 This is an officially licensed Tetris merchandise, and there are the words “Epic Fail”.